If you want a quiet getaway and enjoy staying on a tranquil beach, Terengganu is the perfect destination to stay in. Terengganu homes to some of the country most beautiful shorelines and is one of the most visited states in Malaysia. Depending on the type of holiday you wish to enjoy in Malaysia, accommodations that suits every budget can be found throughout Terengganu. 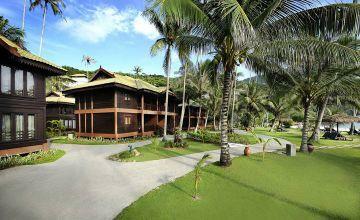 Most of the accommodations here in Terengganu range from hotels to all inclusive luxury beach resorts and chalets. High end accommodations in Terengganu provide private massage and spa service to personal tours and excursions arrangements, staying in any of these hotels or resorts ensure a hassle free vacation in Terengganu. If you wish to stay in a superior resorts with top notch beach experience, Redang Island and Perhentian Island are both spectacular. Accommodations here range from the most luxurious beach resorts in Terengganu to the more affordable lodges and inns. Overlooking the beautiful ocean, it provides a relaxing ambiance that allows you to enjoy the most from the beach has to offer. If you are looking for a more affordable island vacation, visit Kapas Island, where inexpensive resorts and hotels can be found. For travelers who are looking for a more diversified range of accommodations in Terengganu, inns, home stay, hotels and resorts in Kuala Terengganu can be found to suit every budget. Kuala Terengganu is the largest city in Terengganu and also homes to several sightseeing spots as well as some beautiful beaches and waterfalls, this is a good place to stay in for travelers who prefer to stay in the city instead of island. Most of the visitors to Terengganu will mostly enjoy on its beautiful islands and gorgeous beaches. Nowadays, there are also many visitors touch down to the state for golf. There are quite a few top notch golf courses in Terengganu and these golf courses normally offer fantastic onsite accommodation which is perfect for family vacation or golf vacation.